Mavoor is the largest village in Calicut district in Kerala, India.It is 20km away from Calicut city.Mavoor was the place for storing grass which is used to build houses.Hence the former name of mavoor was Pulparampu.Until 1960s, Mavoor was also like any other village in Kerala-an undeveloped one.But in 1960s Birla Management started a factroy named Gwalior Rayons for producing pulp and fibre.The arrival of Gwalior Rayons caused a rapid change in the life style of native people and a tremendous development. Later Gwalior Rayons was renamed as Grasim.All the facilities such as transportation,Schools,hospital,Police station etc became available at Mavoor. In 1985 Grasim had shut down for 3 years,that caused 11 suicides in Mavoor itself.Because the employees were completely depending on Grasim.At last in 1988 Nayanar Government offered more concessions to the management and the factory re-opened. But the situations were not better.Protests were growing from all around on the pollution caused by the factory.Management was not ready to use any pollution control norms.Pollutants produced by Grasim mainly affected the river Chaliyar which flows beside the factory.Many environmental organizations started visiting Mavoor.And also the management was fed up with the series of labour strikes and unions.All these things in turns ended in the shuting down of Gwalior Rayons in 2002. 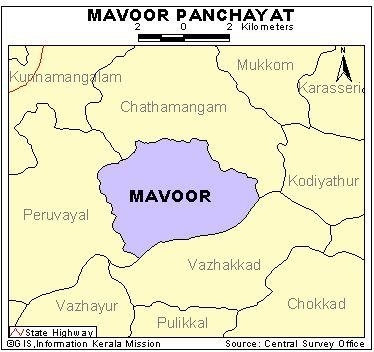 Mavoor is famous for its religious harmony.Many Temples, Mosques and Churches are situated in the nearby places.Any communal problems are not reported from Mavoor until now.Mavoor Juma masjid,Kalchira Sree Narasimha moorthi kshethram,Little flower church etc are the major religious centers in Mavoor. Arts and sports clubs drive the cultural aspirations of people.Mavoor Public Library which is on the ground floor of Grama Panchayath Office provides a lot of books and journals for readers.